While the crowds slow traffic to the beaches of the north Oregon coast, if you venture further down I-5 before heading to the water, a wide open paradise is yours for the taking. Southern Oregon beaches may be the best kept secret in the state. For views that stretch unimpeded for miles, with rarely another human in sight, this is the place to be. Come along as we cruise down Highway 101 finding hidden gems and jaw-dropping vistas. Sandy trails lead through the shrubby parts of the dune walk. Photo courtesy of Jessica Beauchemin. 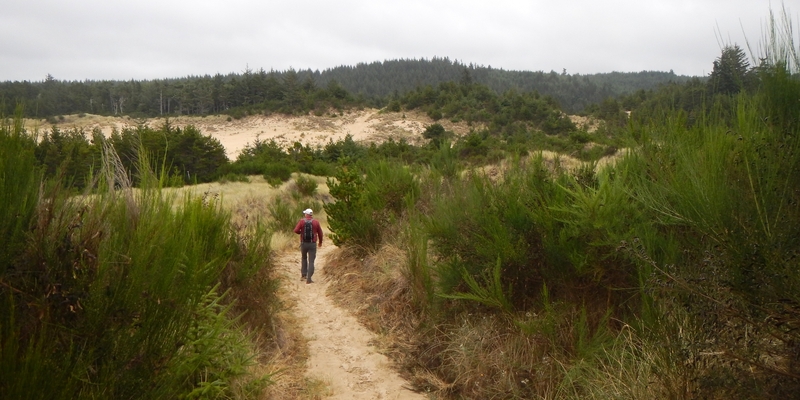 Part of the Oregon Dunes National Recreation Area, the Carter Dunes are special in that it is a hiker-only portion that is totally free of the noise from OHVs. Rolling dunes marked by several types of beach grass create a spectacular backdrop to the sound of the ocean. Not a terribly long hike at 2.70 miles, this trail can be done as a semi-loop by utilizing the paved road in Carter Lake Campground. You are practically guaranteed solitude here due at least in part to restricted beach access March 15 through September 15 to protect snowy plover nesting. Carter Dunes is an off-season hiker’s paradise because it is less popular with the crowds that head to other beaches during the higher use summer months. Simpson Reef Overlook provides a fantastic view into the Oregon Islands National Wildlife Refuge. Photo courtesy of Halvor Tweto. 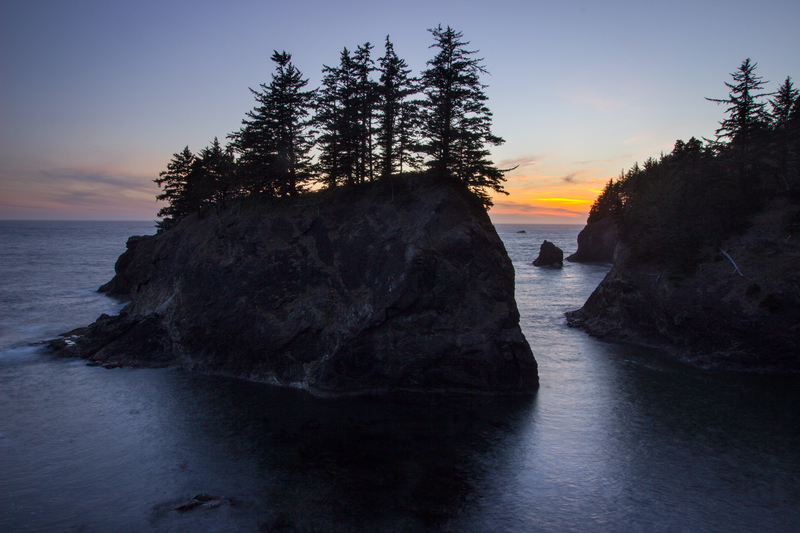 Stretching the entire length of the Oregon coast and holding a massive 1,853 islands, the Oregon Islands National Wildlife Refuge is monumental in its protection of critical habitat under the label of National Wilderness. All of the rocks above and below the waterline are protected and off-limits for human traffic. 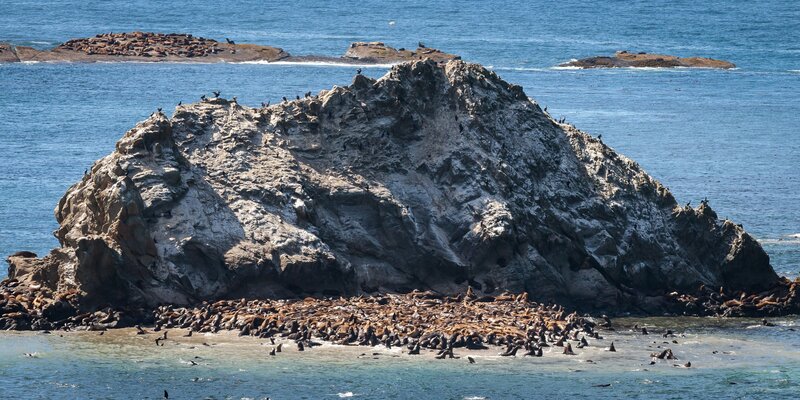 The southern Oregon coast is especially worthy of note as it holds the most significant breeding and pupping sites of the Steller sea lion in the United States. Bring your binoculars and a good telephoto lens when stopping at the numerous viewpoints along the highway for close-up views of tufted puffins and more nesting seabirds than along the Washington and California coasts combined! Sea stacks and dunes at Bandon State Natural Area. Photo courtesy of Denis LeBlanc. With three access points to this remarkable area, the easiest and most developed is from Devils Kitchen. A short hike down to the beach makes it simple to haul a picnic and dig in for the day. Extending several miles down the coast, you’ll be hard pressed to find much in the way of crowds here. Most folks tend toward Coquille Point and Face Rock, to the north. As with all of the locations on this list, bring your camera. With a good telephoto lens, you may snag more personal views of the seastacks just offshore. Be aware that the area south of China Creek is off-limits to dogs during plover nesting season, March 15 to September 15. Cape Blanco. Photo courtesy of Denis LeBlanc. 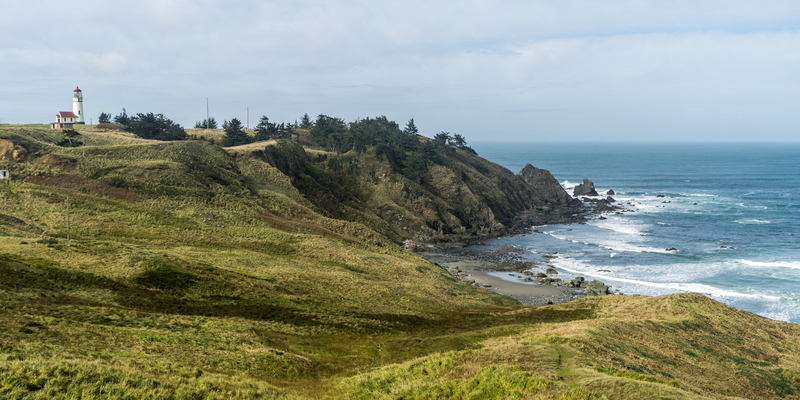 With its unassuming entrance, Cape Blanco State Park might just be the best base camp for your exploration of the southern coast. With 50 electric/water campsites, horse camping, and four rustic cabins, there are enough amenities here to satisfy even picky campers. 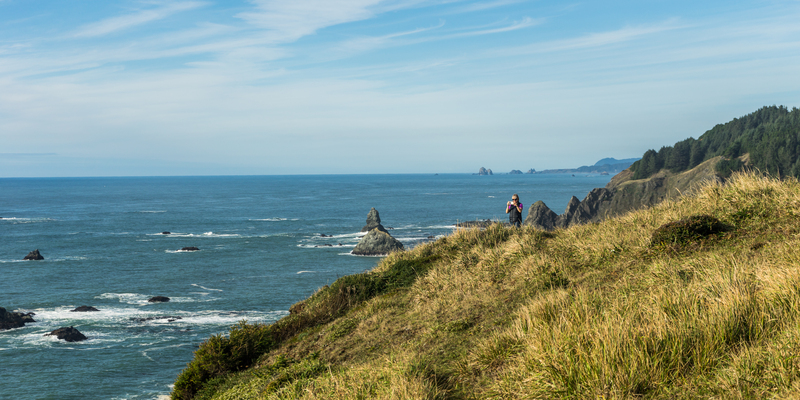 During your stay, Cape Blanco lighthouse is a must-see. As is Hughes House. With miles of hiking trails right from the campground, nearly all with phenomenal ocean views, you might not stray too far from your campsite. 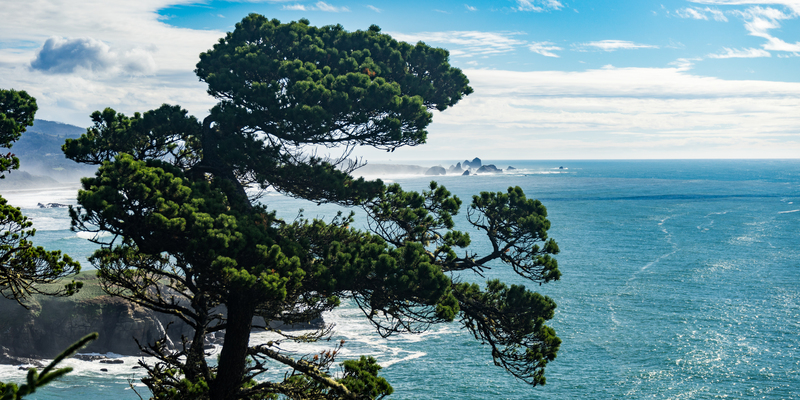 In case you need to stock up on more refreshments, or to find even more trails, Port Orford is a brief drive away. If you’re lucky, you could even spot some of the resident gray whale pod while you’re there. Soon the first views to the south appear. Photo courtesy of Denis LeBlanc. 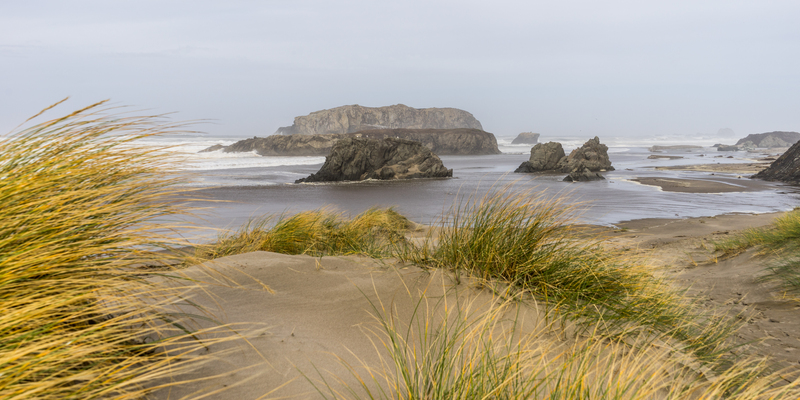 Part of the gorgeous Samuel H. Boardman scenic Corridor, the Cape Sebastian Trail provides viewpoints with some of the longest stretches of beaches in sight. On the north side of the cape, 3.80 miles of perfect hiking awaits. While the return hike might feel a little steep, the effort is worth it. This trail is just one of many gems within the scenic corridor. Running 12 miles along Highway 101 and including 27 miles of the Oregon Coast Trail, all types of wildlife and native plant habitat are ready for viewing. Rid yourself of the car at any of the parking areas along this stretch of road and you’ll find hiking available. 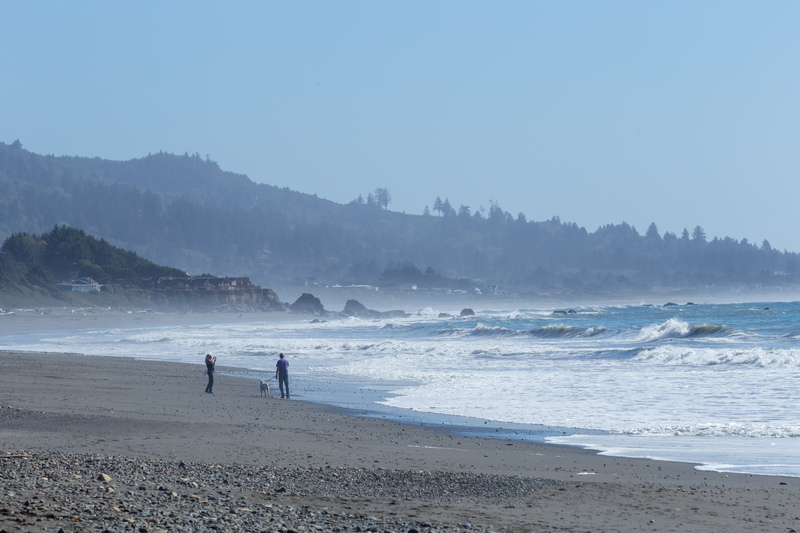 From Arch Rock to Secret Beach, China Beach or Cape Ferrelo, you cannot go wrong in your choices. Named after Oregon’s first park superintendent, this park is a treasure. Looking south toward California. Photo courtesy of Patrick Mueller. Depending on whether you’re coming or going, Crissey Field State Recreation Site beach is either the first beach or the very last Oregon beach you encounter as you cross the state line. Loaded down with bleaching driftwood and littered with rocks the perfect size for chucking into the waves, this site also acts as an Oregon Welcome Center. With the Winchuck River spilling out into the sea, a lagoon is formed in the summer months as waterflow from inland is slowed in the hot sun and sediment silts up. Winter storms make short work of this sandy bar however, as rain runoff bursts out into the ocean. Take your time here to look back up the Oregon coast and down into California. You can practically walk the sands right into another state! Magnificent view from the Cape Ferrelo Trail. Photo by Denis LeBlanc.